Roar is a 1981 American adventure comedy[N 1] exploitation film written and directed by Noel Marshall, produced by and starring Marshall and his then wife, Tippi Hedren, and co-starring Hedren's daughter, Melanie Griffith, and Marshall's sons, John and Jerry. The film follows a family who are attacked by a range of ravening lions and other big cats at the secluded home of their keeper. The film was released theatrically in Europe in 1981, but was a financial failure. It was released theatrically in the United States for the first time on April 17, 2015. Hedren co-wrote the 1985 book Cats of Shambala about her experience of filming Roar. Hank (Noel Marshall) is an American man that lives with multiple lions, tigers, cougars, jaguars, and other wild animals in Africa to study their behavior and interactions with each other. His wife Madeleine (Tippi Hedren), her two sons (John and Jerry Marshall), and her daughter Melanie (Melanie Griffith) have come from Chicago to an airport so that he can bring them back to his ranch, though he ends up being late. His friend Mativo (Kyalo Mativo) offers to take him by boat to pick them up, and warns him that a committee is arriving to review the grant for his land. As they wait for the committee, Hank takes Mativo on a tour around his ranch. The pair discuss the lions that live in the area and Hank explains the nature of the cats. Mativo expresses his fear of the cats, but Hank assures him they won't hurt him, though Hank mentions his anxiety with a rogue lion named Togar, who is in the midst of a quarrel with Robbie the pack leader. The committee arrives and shows disapproval of the state of the ranch, including a man named Prentiss (Steve Miller), who is angered by the presence of tigers and threatens to shoot the animals. A fight between Robbie and Togar distracts Hank, who leaves to break up the fight. The tigers sink one of the committee member's boats and start attacking them, making them flee in panic. Meanwhile, Madeleine and the other three board a bus to reach the ranch. They enter the house, only to realize it has been left unattended. When Madeleine and Jerry open a window, they see a pack of lions eating a zebra carcass. Frightened, they try to hide in different rooms from the lions. Togar chases them, and Jerry tries to shoot him, but fails to do so. Hank and Mativo leave to reach the airport, but have to take bikes from the villagers after a tiger sinks Mativo's boat. They realize that they can't take the lions to the airport, so Mativo distracts them from a tree while Hank finds a local, who tells him that his family already took the bus to meet him at his ranch. Hank uses the local's car to drive back and get Mativo, who distracted the lions by sleeping in a tree. While driving to the airport, Hank gets a flat tire, so they travel on foot. John, who decides that he will try to drive the motorcycle out of the home to get help, instead accidentally steers it into the lake. The family, in a final effort to escape the lions, hide out in a smaller building. They are surrounded by the pack when they awaken, and conclude that since they were not attacked in their sleep, the animals are not as vicious as they imagined. Prentiss and another man named Frank (Frank Tom) try to persuade the other members of the committee to drive the animals off the land, with no success. Prentiss and Frank decide to poach the big cats that wander off his property anyway, with Prentiss killing one lion named Tommy. Hank finds Tommy's body and mourns over him. As Prentiss and Frank shoot more lions, Togar springs and mauls both of them to death. Hank sees this and tries to stop Togar, leading Togar to run away. Togar returns to the house to fight Robbie, along with Hank, who finds his family waiting for him. The two lions end their fight, with Robbie standing up to Togar. Mativo soon catches up, and is asked by Hank not to mention Prentiss' death. Mativo is introduced to his family, who agree to stay with him and his animals for the week. The film ends with a montage of the group bonding with the animals. After the end credits, the text tells of Africa's high percentage of animal extinction, while encouraging viewers to contribute to wildlife organizations and protest the distribution of animal skins, furs, and ivory. The idea was conceived by Noel Marshall and Tippi Hedren in 1969 after the two had completed Satan's Harvest in Mozambique. The two came across an abandoned plantation house in Zimbabwe that had been overrun by a pride of lions, and were told by the locals of the shrinking animal populations due to poaching, which inspired them to make a potential film as a response. Marshall and Hedren made a script for the film, which required several trained big cat species to mimic Africa's wildlife atmosphere. They had trouble finding enough animals in Hollywood for the film, with the lion tamers telling them both that it was impossible to bring that many big cats on a movie set. The tamers suggested that Marshall and Hedren get their own animals and gradually introduce them to each other, so they started bringing lions and cubs into their Acton, California ranch home for preparation. The family accumulated more than 30 cats, which they began training. John Marshall, Noel's oldest son, lived at the ranch with two friends for six months and shared rooms with a group of 15 lions. The total number of cats eventually reached around 100. Hedren later established the Shambala Preserve sanctuary in 1983, which was settled 64 kilometers outside of Los Angeles to house them after filming was finished. Roar was shot on location at Noel Marshall's ranch, with its production spanning a total of 11 years. A flood at the ranch three years into the shooting process caused over $3 million in damages, creating further setbacks to the production. Over 70 of the cast and crew are believed to have been injured during the production of Roar. Because of this, many of the attacks from the animals resulted in real blood from the actors showing up in the final cut of the film. It has been viewed as the most dangerous film ever made. Tippi [Hedren] disputes the number. I believe that number is inaccurate – I believe it's over 100. It's somewhere between 70 and 100. It is the most dangerous film ever made in history. Nowadays, there's so much regulation, if you're working on a film and two people get injured, they come in and they shut you down. They have safety meetings and they say, 'What are we gonna do to change this situation?' If they did that to us after two bites, we would have said, 'I don't know what else we can do differently. Should we do it with dogs? I don't know!' If we wanna make a movie with lions, people are gonna get bitten. We just hope that nobody dies and we'll do everything we can to makes sure that doesn't happen. Marshall's brother Jerry was bitten in the foot while wearing tennis shoes on set. He later jokingly said the lion had a "tennis shoe fetish." Assistant Director Doron Kauper had his throat bitten open, his jaw was bitten, and one of the lions attempted to rip an ear off. He was also injured in the head, chest, and thigh. Although it has been reported that the attack nearly proved fatal, a July 9, 1978 edition of the Santa Cruz Sentinel printed a quote from a nurse describing his injuries as acute, meaning simply that they were sudden and traumatic. He was also reported as being conscious and in a fair condition. Terrence P. Minogue composed the film's score. He used a piano that he shipped to the family's ranch to help write the music. Robert Florczak, sometimes credited as Robert Hawk, provided vocals in songs. Dominic Frontiere was also a composer on the film's soundtrack. The soundtrack was originally released in 1981. It was later available online in 2005. 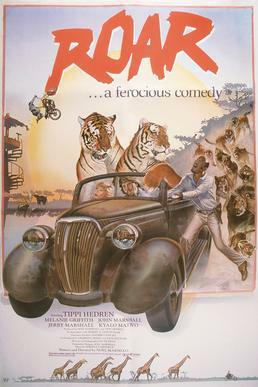 Though released in 1981 and 1982 in Australia and European countries, Roar was not released theatrically in the United States. In 2015 the film was picked up for distribution by Drafthouse Films, 34 years after its production. It screened it across the United States at various independent cinemas. The film received sparse releases on VHS. Following its 2015 theatrical release in the United States, it was subsequently released on Blu-ray in November 2015 for the first time. Upon its initial release, Variety said the film was "a passionate plea" to preserve African wildlife, that it "aims to be a kind of Jaws of the jungle" and it "seems at times more like Born Free gone berserk". Time Out said the film represented a portrait of the Marshall family as "mega-eccentrics and misguided animal lovers" and called its narrative and plot "a farcical melange of pseudo David Attenborough and Disneyspeak", which was accompanied by "fickle camerawork." After the film's 2015 re-release, Amy Nicholson of L.A. Weekly said the film was a "thrilling bore", and that the premise was "simply "Big cats destroy a house"". Simon Abrams from RogerEbert.com gave the film a 2 and a half star rating, and said Roar was "worth seeing once", but that it was hard to watch because "while it is a cat lover's delight, it's also pretty dumb." Hubert Vigilla of Flixist.com was critical of the film, and said its production was dangerous, irresponsible, and made a "compellingly idiotic" home movie that happens "when naive rich people get a bunch of wild animals together in a remote Los Angeles-area mansion". Andrew McArthur from The People's Movies called it "a cinematic experience like no other", and labeled it a "cult masterpiece", while also praising the soundtrack and Bont's cinematography. On review aggregator website Rotten Tomatoes, Roar has an approval rating of 70% based on 20 reviews, with an audience score of 51% based on 1,857 user ratings. The website's critical consensus reads, "Roar may not satisfy in terms of acting, storytelling, or overall production, but the real-life danger onscreen makes it difficult to turn away." On Metacritic, the film has a weighted average score of 65 out of 100, based on 9 critics, indicating "generally favorable reviews". ^ In press notes, Noel Marshall said the film carried comedic tones. ^ Patches, Matt (April 2, 2015). "Looking Back at Roar, a Shocking, Lion-Filled 1981 Movie You've Never Seen (Yet)". Esquire. Retrieved April 14, 2019. ^ Dirks, Tim. "Greatest Box-Office Bombs, Disasters and Flops: The Most Notable Examples". filmsite.org. Retrieved December 1, 2008. ^ a b c d Bahr, Lindsey (April 16, 2015). "'Roar': "Most Dangerous Movie Ever Made" Charges Into Theaters". The Hollywood Reporter. Retrieved June 18, 2016. ^ a b Stobezki, Jon (February 19, 2015). "Utterly Terrifying ROAR, Starring Tippi Hedren & Melanie Griffith, Joins Pride Of Drafthouse Films". Drafthouse Films. Retrieved April 17, 2015. ^ Paul, Louis (2007). Tales from the Cult Film Trenches: Interviews with 36 Actors from Horror, Science Fiction and Exploitation Cinema. McFarland. ISBN 0786429941. ^ a b c d e f Onda, David (July 9, 2015). "The Unbelievable True Stories Behind 'Roar,' the Most Dangerous Film Ever Made". Xfinity. Movies. Comcast. Retrieved June 17, 2016. ^ a b c d e "Shambala Preserve, Acton, California". InterestingAmerica.com. November 24, 2010. Retrieved May 16, 2015. ^ "Living with lions". The Economist. May 5, 2015. Retrieved June 16, 2016. ^ "Tippi Hedren Learns the Law of the Jungle: When An Elephant Decides to Ad Lib, Look Out". People.com. Retrieved May 16, 2015. ^ "Watch a trailer for the re-release of 'Roar', the most dangerous film ever made". Soundonsight.org. March 11, 2015. Retrieved May 16, 2015. ^ "This Family Lived With A Real Lion Back In 1971". Earthporm.com. Retrieved May 16, 2015. ^ a b "Drafthouse Films releasing the bizarre lion-filled cult movie Roar". Flixist.com. February 20, 2015. Retrieved May 16, 2015. ^ "Tippi Hedren, Crazy Cat Lady Extraordinaire". Alfred Hitchcock Geek. October 11, 2012. Retrieved May 16, 2015. ^ "Trailer For 'Roar' – The Most Dangerous Film Ever Made". MovieHooker. March 11, 2015. Retrieved May 16, 2015. ^ "Santa Cruz Sentinel from Santa Cruz, California · Page 6". Newspapers.com. July 9, 1978. Retrieved May 16, 2015. ^ Peters, Clinton Crockett (October 9, 2018). "The Most Dangerous Movie Ever Made". Electric Literature. Retrieved April 6, 2019. ^ a b McArthur, Andrew (August 8, 2015). "EIFF2015 Review – Roar (1981)". The People's Movies. ^ R. Hasan, Mark (June 18, 2015). "Film: Roar (1981)". KQEK.com. ^ Buder, Emily (July 7, 2015). "'Holy F*cking Sh*t' Discovery of 'Roar,' the Most Dangerous Movie Ever Made". IndieWire. Retrieved June 18, 2016. ^ Logan, Elizabeth (February 19, 2015). "Drafthouse Films Acquires '80s Cult Classic 'Roar,' Plans Theatrical Release". IndieWire. Retrieved September 28, 2018. ^ Staff (December 31, 1980). "Roar". Variety. Retrieved June 2, 2016. ^ "Roar". Time Out. Dec 5, 2004. Retrieved March 24, 2019. ^ Nicholson, Amy (April 15, 2015). "A Celebrity Family Adopted 150 Dangerous Animals to Make This Movie — and It Nearly Killed Them". L.A. Weekly. Retrieved June 9, 2016. ^ Abrams, Simon (April 17, 2015). "Roar Movie Review & Film Summary (2015)". RogerEbert.com. Retrieved March 25, 2019. ^ "Roar (1981)". Rotten Tomatoes. Fandango Media. Retrieved March 24, 2019. ^ "Roar Reviews". Metacritic. CBS Interactive. Retrieved March 24, 2019. This page was last edited on 21 April 2019, at 17:39 (UTC).